SimpleChIP® Human DHFR Intron 1 Primers were tested on DNA isolated from cross-linked cells using the SimpleChIP® Enzymatic Chromatin IP Kit (Magnetic Beads) #9003. Real-time PCR was performed in duplicate on a serial dilution of 2% total input DNA (20 ng, 4 ng, 0.8 ng, and 0.16 ng) using a real-time PCR detection system and SYBR® Green reaction mix. The PCR amplification efficiency (E) and correlation coefficient (R2) were calculated based on the corresponding threshold cycle (CT) of each dilution sample during 40 cycles of real-time PCR (95°C denaturation for 15 sec, 65°C anneal/extension for 60 sec). 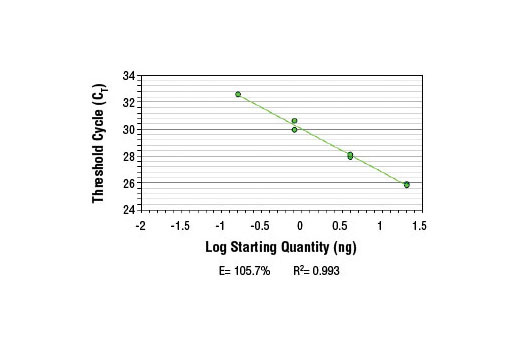 PCR product melting curves were obtained for real-time PCR reactions performed using SimpleChIP® Human DHFR Intron 1 Primers. Data is shown for both duplicate PCR reactions using 20 ng of total DNA. 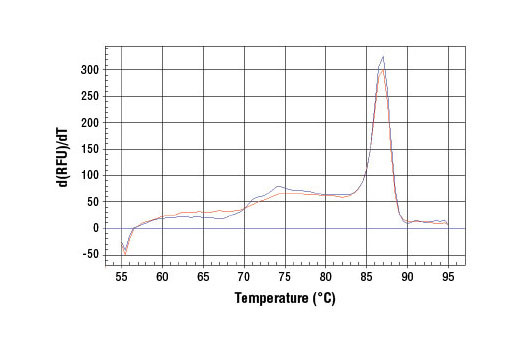 The melt curve consists of 80 melt cycles, starting at 55°C with increments of 0.5°C per cycle. Each peak is formed from the degradation of a single PCR product. SimpleChIP® Human DHFR Intron 1 Primers contain a mix of forward and reverse PCR primers that are specific to the intron 1 region of the human dihydrofolate reductase (DHFR) gene. These primers can be used to amplify DNA that has been isolated using chromatin immunoprecipitation (ChIP). Primers have been optimized for use in SYBR® Green quantitative real-time PCR and have been tested in conjunction with SimpleChIP® Enzymatic Chromatin IP Kits #9002 and #9003 and ChIP-validated antibodies from Cell Signaling Technology®. The DHFR gene is actively transcribed in all cell types and is required for cell growth. There are several GC elements around the DHFR promoter that when bound by SP1, promote gene transcription.